How to make homemade ramen noodles from scratch. These firm yellow Chinese style noodles are made with flour, kansui and water. If you’ve been following along for any length of time, you probably know I’ve been working on concocting the perfect bowl of ramen for quite some time. With the soup improving with each batch I made, I was starting to feel like the store-bought noodles were the weak link holding the entire bowl of ramen back. It was time to tackle the noodles, but given the decade of trial-and-error it took to get the soup right, I figured I was in for another dozen years of experimentation before I’d turn out a decent batch of noodles. Part of the problem is that there isn’t much information out there in English on making ramen noodes. Even in Japan, noodle making is a closely guarded secret and you don’t see ramen shops parading around their recipes on the web. From the information I was able to glean, I knew that the noodles are made with wheat flour, and get their yellow color and distinctly firm texture from the addition of kansui. I also knew that they’re traditionally hand pulled, which means the dough has a higher water content than noodles you’d roll and cut. Since noodles get their texture from the proteins in the wheat forming elastic chains of gluten, I decided to use bread flour, which typically contains 12-14% protein (higher than all-purpose flour). I also knew that learning how to hand pull noodles as fine as ramen was a skill that would take far longer to master than I, or many of my readers would have patience for, so I decided to make a dryer dough that could be rolled and cut using a pasta maker. Batch #1: I made this with 2 cups bread flour, 2/3 C water and 1/2 teaspoon of liquid kansui. Everything went into a mixer with a dough hook until the dough came together. Then I formed it into two squares, wrapped and refrigerated one, and rolled out the other. I rolled it out to setting #5 of on the pasta maker and cut it using the spaghetti attachement, then boiled the noodles for 1 1/2 minutes. This batch had a couple of problems. The dough was a bit tacky, so even after being dusted with flour, the noodles stuck together in pairs of two and had to be hand separated. I’d also rolled it out too thin and by the time the noodles were in the ramen, they were soggy. The dough also lacked the lustrous yellow color I was looking for. Batch #2: After resting in the fridge overnight, I took the other half of the first batch and rolled it out, this time only to setting #3. It was still sticking together, but the noodles had a nice firm texture when cooked. Batch #3: For this batch, I used 2 cups of bread flour, reduced the water to 1/2 cup and increased the kansui to 1 teaspoon. As soon as I added the water/kansui mixture I knew this batch was going to be better, as the flour immediately turned a bright golden yellow. I let the mixer run for 10 minutes this time and the mixer bowl was full of golden yellow nuggets. I was worried I hadn’t added enough water, but with a little hand kneading it came togehter into a ball, and let this rest overnight in the fridge. The next day, I cut the dough in half, rolled it out to setting #3 and cut it with the spaghetti attachment as before. This time the noodles didn’t stick together, and I reduced the boiling time to just over a minute. The noodles were extremely firm (almost too firm), but by the time I had the soup and all the toppings on the ramen, they were the perfect texture and stayed that way until the last drop of soup was gone. Success! 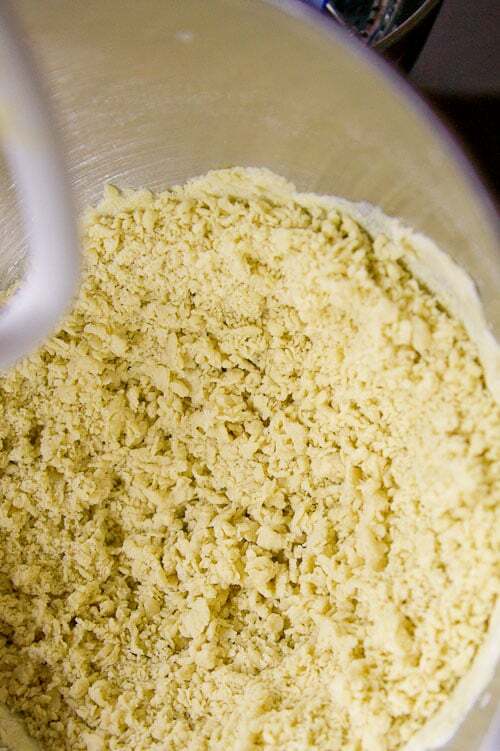 If you’re wondering what kansui is, it’s the ingredient that makes all the magic happen. The story goes that the unique noodles produced around lake Kan in Inner-Mongolia were attributed to the water from the lake. Modern science has since revealed that the lake is highly alkaline, which is what gives the noodles their unique texture and color. You can now buy factory produced “kansui” (lake kan water) either in powdered or liquid form. I used a brand called Koon Chun which labels their product as Potassium Carbonate Sodium Bi-Carbonate. Kansui is a mixture of sodium carbonate and potassium carbonate which form an alkaline solution (pH ~9) when mixed with water. Wheat flour contains a number of compounds called flavones and trans-ferulic acid which are bound to starch and therefore colorless or white. The addition of an alkaline solution to wheat flour changes the pH of the mixture which in turn detaches these flavones (specifically apigenin glycosides) and trans-ferulic acid from starch and allows their natural yellow color to manifest. Another reason for the addition of kansui is to toughen the protein in wheat flour so that the resulting noodles are firmer, more elastic and springy texture and less sticky when cooked. The addition of Kansui allows the use of lower protein (and therefore less expensive) wheat flour to make noodles with the quality one would expect of noodles made with superior quality flour with higher protein levels. 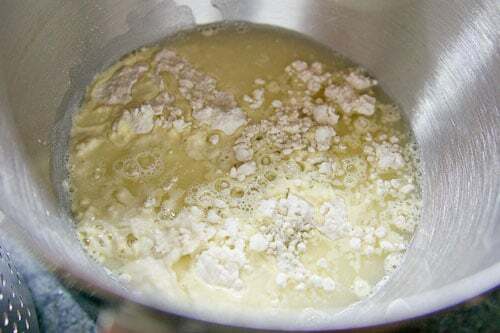 Put the flour in the bowl of a mixer fitted with a dough hook. Mix the water and kansui together, then add the mixture to the flour. The flour should immediately start turning yellow. If it doesn't, it's possible your kansui is less concentrated than the one I used, in which case, you will need to experiment to figure out the right amount to add. Give the mixture a quick stir with a fork or chopsticks to combine everything then attach the bowl to your mixer and run on medium high speed for 10 minutes. It's a dry dough so it will look like a bunch of gravel at this point. Use your hands to divide it in two and press together into two balls. Flatten each ball out on a flat surface, and run it through the largest setting of your pasta roller a few times, folding it in half each time. The dough will be ragged the first few runs though but will smooth out. When it starts rolling out smoother, fold it up into a square and wrap with plastic wrap and store it in the fridge overnight. When you're ready to cook it, prepare a large pot of boiling salted water. Each ball will make enough for 2 bowls of ramen, so figure out how much you need. Flour the dough generously and roll it out to the 3 setting on your pasta roller. Cut the dough in half so you have two sheets of dough a little over 1 foot long and flour generously again. 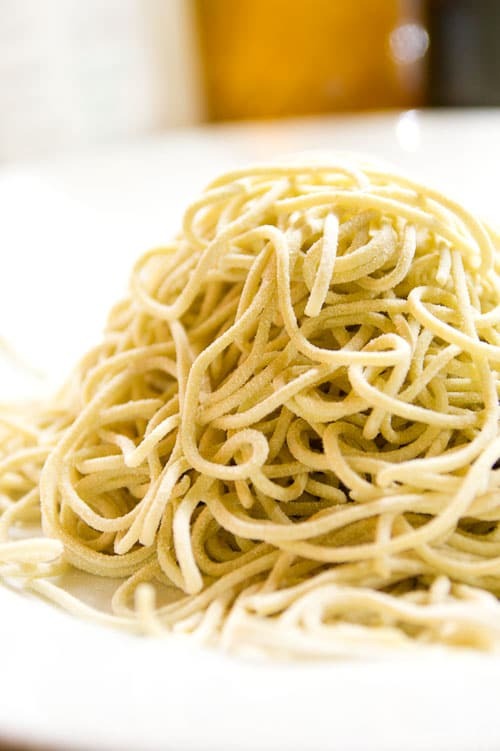 Use the spagetti attachment to cut the pasta into long thin noodles, dusting them with flour as they are cut to keep them from sticking together. 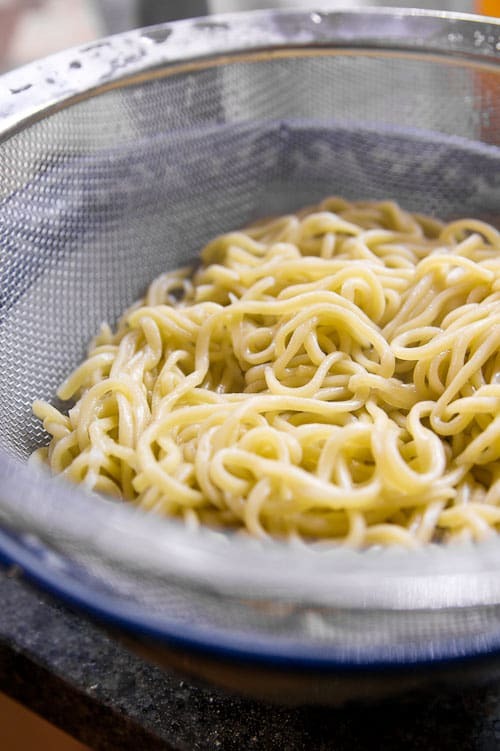 Boil the noodles until they are slightly firmer than the final consistency you want, since they will continue cooking after you remove them from the water. I usually let them boil for about one minute. Wow this is great! Thanks for this– I just love ramen so will have to try your recipe soon. Thanks for shedding some light on the mystery of noodle-making! I’ve wondered how it’s done for a while now, and this recipe is another reason for me to get a pasta machine! Making noodle at home is fun! I am enjoy it. Only one thing I have been missing was “kansui.” I couldn’t find the places to buy it, so I have been using baking soda. Thank you for the information about it.! several weeks ago, including how to make them. Very impressive! David Chang includes a recipe for alkaline noodles in the Momofuku cookbook, but I’ve never dared tackle the project. I am so happy I found your blog—thanks for reaching out to me on Foodbuzz. You are an exquisite chef and have a great writing style. I have a weak spot for raman. I’d love to make some with your recipe. Unbelievable. Firstly, an awesome photo. And then a great story. Thank you for your open and honest work. It is so appreciated. Very interesting. Really a good job!! Congratulations. I am so glad you did this as I would never have tried this project. You are truly a master and I so enjoy your posts. Wow. My boyfriend and I are working on mastering hand-pulled noodles for homemade ramen but it’s not going so hot. This seems like a much easier technique. We’ll definitely be trying this out! When am I getting a bowl of this ramen? I love ramen! Can’t say that I will make the noodles from scratch — I’d probably be likelier to hop a flight to NYC or Honolulu to eat ramen there instead — but I loved learning about the kansui and how the noodles are made. Thank you for the informative post! I am seriously addicted to ramen. I am known to disappear for longer than I should during lunch just so I can sit at the counter at my favorite noodle shops and savor a bowl of the good stuff. I am so delighted to learn about the secret of kansui. I knew it wasn’t an egg noodle, so now I feel fulfilled. Fantastic post, Marc. Thanks. Here is the article you are referring to, from Harold McGee, including info on how to make your own strong alkali. Good for other things too, like pretzels. I want to get into more noodle making, so I really appreciate this post. Thank you. Umm… This is amazing. Good Ramen noodles are hard to beat. Wow! Perseverence pays off big time! Great job on everything from research, tirals, and photos! Thanks for sharing. Very cool post. I was looking for an home made noodles recipe. These noodles sound awesome! I can’t wait to try this one out! You are my savior. I have searched all over the internet for this information. After weeks of frustration and dissapointment you have delivered the secrets I sought. This is the only recipe for ramen, I’ve found, that uses the rumored “special water” instead of egg, and which confirmed my suspicion that ramen would have been origonally hand pulled. ARIGATOO GOZAIMAS!!!!! Certain kinds of noodles are hand-made. You can find tons of videos on Youtube on how the chefs make them. It does take a lot of practice. Thank you for this enlightening post! I will try this recipe as soon as I find some kansui. I have a question though. Do you wash your noodles under cold running water after boiling them? able to do a hybrid between the two recipes. My son would live on Ramen noodles and it used to depress me so, since the package is mostly sodium. Well, with these I would love for him to consume them on a daily basis! I am going to try your recipe, as soon as humanly possible! It is similar to a recipe for noodles that is traditional in Lebanese and Syrian cooking and eaten with a lentil porridge. Very interesting Mark. with the flour? Do you have a recipe for it? How terrible would it be to just use straight baking soda? I expect some adjustments would have to be made, but if it’s mostly about changing the ph, that should work, right? Do you have any recommendations for store-bought noodles for those of us without a pasta making dealy? nice~ i’ve always wondered how to make ramen noodles from scratch… thank you for doing all the research/work! What kind of pasta maker are you using? It would be nice to know the exact product, so us people in Europe can get an understanding of how the device looks and how to find something similar. cut noodles about 2-3mm in thickness. You are my hero! Thank you for posting this. I just went to Alhambra out here in LA to track down the potassium bi carbonate solution, but wasn’t exactly sure how I was going to use it. The recipe I had from Momofuku just said alkaline salts, so I was just going to do a little trial and error. Then I came across your recipe, thank you. 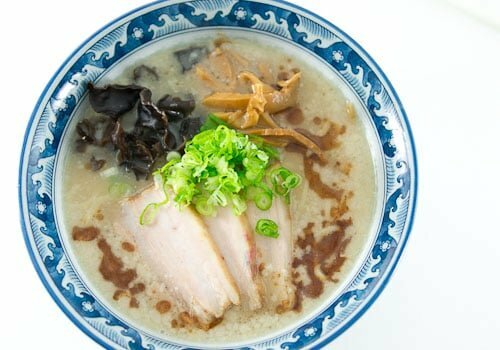 The whole ramen recipe looks fanatastic, I’ve tried many different variations and can’t wait to try this one. These noodles do require a bit of faith and perseverance to pull off, but boy are they worth it! I coupled them with tonkotsu broth had one of the best bowls of noodle soup on record! I acquired the Koon Chun kansui from Asia Supermarket.com. Hi, just to let you know I bought both sodas in powder form in the chemist. I mixed them 60% / 40% and I dissolve 1 tsp into the warm water and then add it to the flour. The noodles come out great but if I try to dry them they turn grey. I am making them fresh everyday but also have an emergency stock in the freezer, which also works out well. BOOKMARK! I have been searching the web for the last week for a ramen noodle recipe and this is the first one I’m excited about trying. I stayed in Japan for 3 months when I was in college and I haven’t had a decent bowl of ramen since! During my search for the perfect recipe I have come across ones that include egg or where the noodle is fried… Do you have any experience with ramen noodles that are prepared this way and whether either of those would contribute anything to the chewy texture that good ramen has? Just some forewarning, this dough will not hold together by itself. If you add enough water to make it hold together, it won’t cut properly. I do like your idea of letting the rolled dough dry a little before cutting it and will try this out next time with a little more water in the dough to make it easier to work with. So I tried out the recipe and I like the texture better then any of the other recipes I’ve tried. The noodles had the texture I was looking for… but it loses some of the springiness before I can finish the bowl. Do you think adding a tiny bit more kansui may help? damn thanks for the tricks!it really worked.Am sooooo glad it really worked out just as instructed. I left half of the dough for tomorrow and see the difference. I let my staff taste the noodles and they were extremely amazed how I did it.